O ETERNAL and incarnate Wisdom! O sweetest and most adorable Jesus! 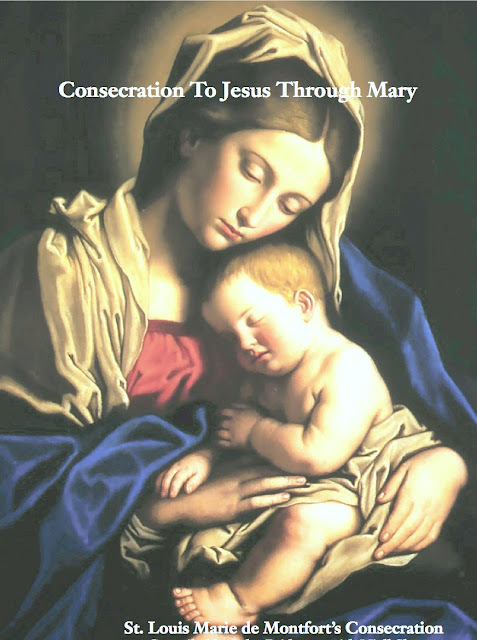 True God and true man, only Son of the Eternal Father, and of Mary, always virgin! I adore Thee profoundly in the bosom and splendors of Thy Father during eternity; and I adore Thee also in the virginal bosom of Mary, Thy most worthy Mother, in the time of Thine incarnation. I give Thee thanks for that Thou hast annihilated Thyself, taking the form of a slave in order to rescue me from the cruel slavery of the devil. I praise and glorify Thee for that Thou hast been pleased to submit Thyself to Mary, Thy holy Mother, in all things, in order to make me Thy faithful slave through her. But, alas! Ungrateful and faithless as I have been, I have not kept the promises which I made so solemnly to Thee in my Baptism; I have not fulfilled my obligations; I do not deserve to be called Thy child, nor yet Thy slave; and as there is nothing in me which does not merit Thine anger and Thy repulse, I dare not come by myself before Thy most holy and august Majesty. It is on this account that I have recourse to the intercession of Thy most holy Mother, whom Thou hast given me for a mediatrix with Thee. It is through her that I hope to obtain of Thee contrition, the pardon of my sins, and the acquisition and preservation of wisdom. Hail, then, O immaculate Mary, living tabernacle of the Divinity, where the Eternal Wisdom willed to be hidden and to be adored by angels and by men! Hail, O Queen of Heaven and earth, to whose empire everything is subject which is under God. Hail, O sure refuge of sinners, whose mercy fails no one. Hear the desires which I have of the Divine Wisdom; and for that end receive the vows and offerings which in my lowliness I present to thee. He has filled the hungry with good things, and sent the rich away empty-handed. He has protected his servant Israel, keeping his merciful design in remembrance, according to the promise which he made to our forefather, Abraham and his posterity for evermore.